It's not like we need another reason to obsess over Beyoncé's Lemonade. The powerful music and imagery of the HBO special are not things we'll be quick to forget. But a cherry on top of the one magical hour is that Beyoncé's style throughout can only be described as flawless. She changes often throughout the film, wearing minimalist Yeezy pieces, extravagant Victorian-inspired gowns, and our favourite, a blouse by one of NYC's coolest designers, Rosie Assoulin. Beyoncé styles the ruffle-sleeved top with camo-print trousers, balancing out the grandeur of the piece with something simple on the bottom. If you have yet to check out Lemonade, just know it's Queen Bey at her finest! Read on to see her look, and shop the top along with a few other pieces by Rosie Assoulin! 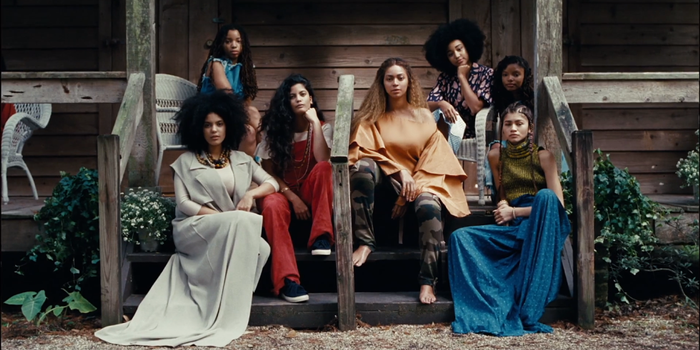 Which look from Lemonade was your favorite? Let us know in the comments!